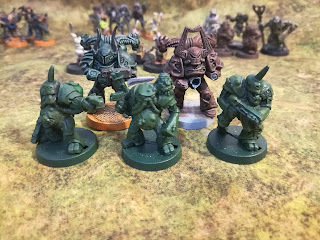 My last Rogue Trader post has been November last year! I started with collecting Copplestone's imperial guard but I have to finish them. I've been sidetracked by many things. Lord of the Rings stuff mostly, a little bit of 15mm. Team Yankee (cold war apocalypse in 1980's Netherlands). And a bit of Neu-hammer. 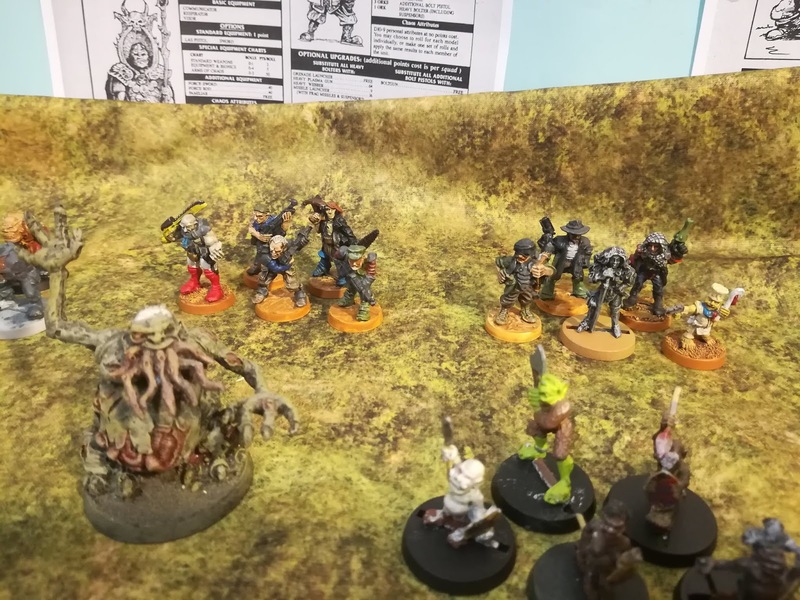 I find this whole thing about Kill Team very inspiring and now with the upcoming Rogue Trader supplement it's just brand new rules for all my old toys. Because that's how I always collected. I only ever had small teams of miniatures I liked. Some space orks, a couple of eldar, some space pirates, imperial guard and a bunch of Nurgle renegades. 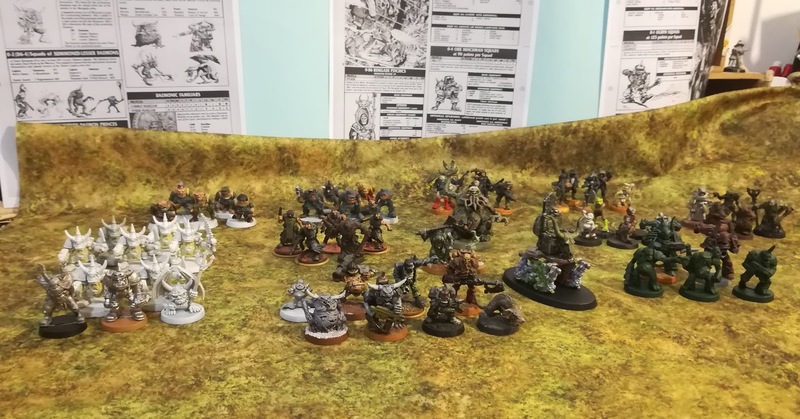 I never had an entire army. 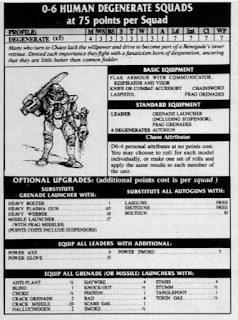 Or so I thought, because a couple of weeks ago this happened: a fellow oldhammerer blogged about the Chaos Renegades armylist. 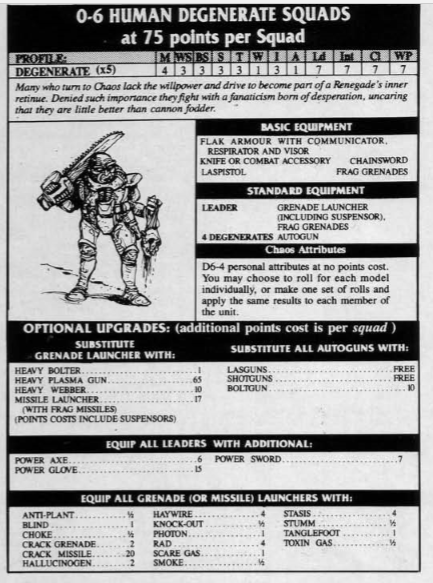 Without me ever knowing, I always had an entire army of Chaos Renegades, but the army list was only ever published in White Dwarf 107, november 1988. Two years before the Lost and the Damned, published only in 1990. 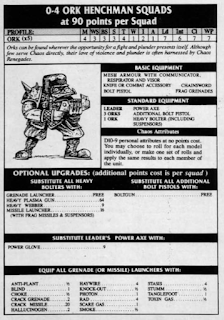 Before I bought my first White Dwarf anyway. This list allows a Chaos warband leading an army of other warbands, renegade marines, space orks and human outcasts. All of them together! I have the Lost and the Damned. That book was how I learned English (apart from hip hop)and made me dream about a massive Nurgle army. I wrote down lots of armies, with doodles of miniatures and conversions I would make. 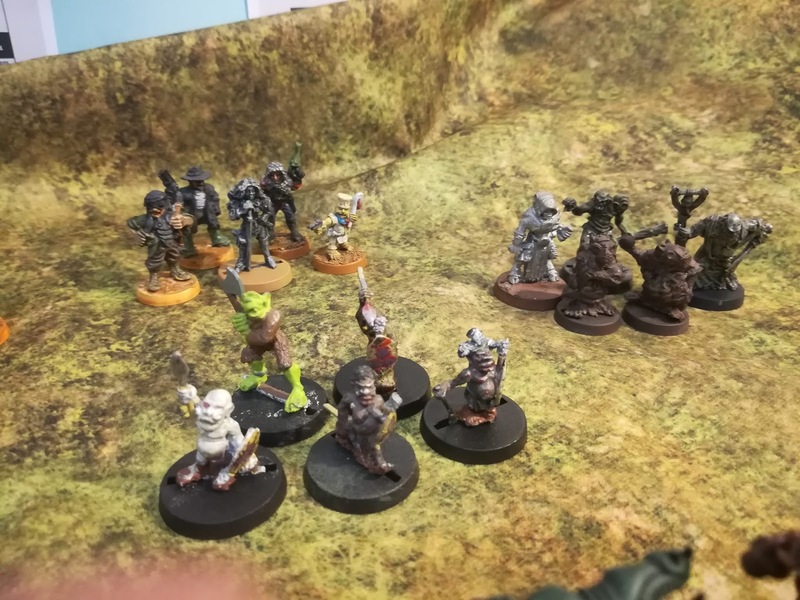 But in the end I only had my small collection of different miniatures. My warlord with heavy bolter. 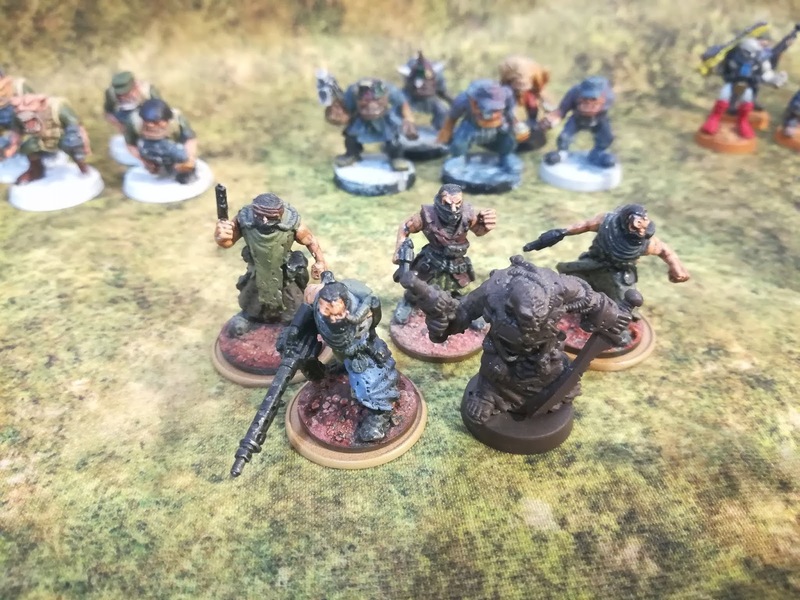 A very old conversion even though the heavy bolter was added much later and the guy with the autogun used to have a zombie head. The Epic daemon was added later. Chaos cultist, now human degenerates apparently. the scavvies are missing their topknots because they used to have pointy hats made of DAS clay, inspired by Lost and the Damned illustrations. Nurgle renegades with two Space Crusade marines. Nurgle Pigmies. Blatantly racist miniatures as most of us would agree these days, but at the time I thought they were fun as alternative halflings. I think nobody realised. There were also beautiful Paul Bonner drawings of these Lustrian pigmies. I have more but I couldn't find them immediately. One double has DAS clay breasts and hair done with sand. The cool thing were the shields that were an early attempt at freehand painting. 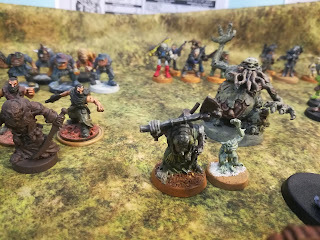 a Great Unclean One with more Human Generates behind him. The Daemon is a much later addition: Games Workshop opened a store in Amsterdam and you could mailorder bits through the store. So I ordered the Epic daemon above but instead they send me this one, and a buch of loose arms, heads and bellies. They send the replacement and let me keep this one. Renegade psyker with familiar. 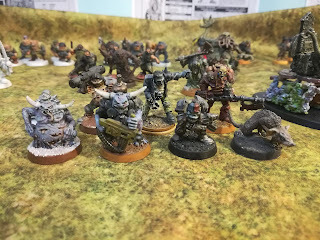 Ork henchmen in the back. More ork henchmen. The Renegade in power armour I got this year. 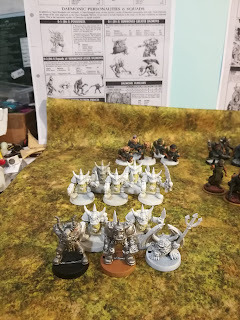 the demon is Heartbreaker while the 2nd plastic orks are a Khorne stormboyz project I already was working on this year. Lovely. Completely lovely. Nice little treasures!